Men of Australia, would you like get a perfectly fitted, tailor-made suit without ever setting foot in a store? Well, today is your lucky day, if you’re willing to submit to an airport-style full body scan. Online tailor InStitchu has teamed up with Australian startup, mPort to fuse the online and offline purchasing experience with 3D body scanning technology. 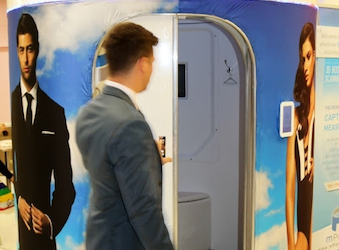 3D body scanners, which have begun rolling out to shopping centres around the country, would help Australian men buy a suit tailored to their exact measurements. “The customer simply steps into a private enclosed area to scan themselves. Their precise body measurements are then instantly captured and stored on their InStitchu profile,” says InStitchu co-founder Robin McGowan. “In their own time, they can then hop on the InStitchu website and design their perfect suit using our customisation platform. “Once they’ve designed a suit unique to their personal preference and style – right down to the stitch colour, buttons, materials and lapel – we send their order to a team of Saville Row trained tailors who use their expertise to create the suit to the required measurements. The suit is then delivered direct to the customers, with the whole process taking just a matter of weeks. McGowan says incorporating mPort’s 3D scanning technology is a huge win for InStitchu’s customers, removing another friction point and making the online tailoring process even easier. “Our goal has always been to make quality tailored suits accessible to all men. To achieve this, we’ve relied upon technology and a smart business model. We’re genuinely excited to have partnered with mPort to deliver this exciting retail innovation to the Australian menswear market. “Only a few years ago, the suit shopping experience was vastly different. Options in Australia were incredibly limited. Some men could afford to fork out the thousands needed to have a suit tailored, but most men relied upon department stores and old-fashioned menswear retailers, generally consigning themselves to ill-fitting, off-the-rack suits. “Making the necessary adjustments to these suits was time-consuming and expensive, so they simply put up with badly fitting suits. “When InStitchu launched, we were able to open the market up for these guys, enabling them to create their own, quality suits at a fraction of the cost that they had been paying. “Although the online measuring tools have been well received, there’s still a lot of men out there hesitant about measuring up on their own. The 3D body scanning technology from mPort is just what they needed to gain the confidence to purchase tailored suits online,” he said. The mPort scanner is currently available at World Square shopping centre, in central Sydney, and will soon be rolling out to other shopping centres throughout Australia.